First things first. I just want to wish you a very Happy New Year! I hope you have some exciting things planned. I have a heap of projects I’m super excited about including buying a little farm house. And hopefully later in the year ‘finding’ a baby brother or sister for Fergal. So I thought we’d start the new year in a big way! I’m super excited about an idea I got from one of my students the lovely Katie Lee. Katie took my very first online cooking class, solve your dinner dilemma back in 2010. Any she had the brilliant idea to do a series of posts focusing on different ways to prepare different vegetables. Such a great idea! So I thought I’d kick things off with one of my all time favourite veg. That also happens to be one of the most nutrient dense foods on the planet. Yes my friend today it’s all about kale! What’s so great about kale? As I mentioned above kale is one of the most nutrient dense foods. Apart from the obvious vitamins (A, C, B6, E) and minerals (manganese, calcium, potassium, iron) it has a relatively high level of protein (for a vegetable). Even better, it contains a number of chemicals that are thought to reduce the risk of cancer. And did I mention it’s delicious? There are hundreds of varieties of kale. The most common are curly kale and the darker coloured black Tuscan kale (also known as cavolo nero, lacinato kale or dinosaur kale). Mostly sold in bunches or as loose leaves of baby kale. Pretty much you’re looking for vibrant green leaves with no signs of wilting. Smaller leaves tend to have a milder (less bitter) flavour so if you’re trying to turn a fussy eater into a kale-lover best to stick to the baby leaves. It will last for 1-2 weeks in the fridge wrapped in a plastic bag. To store for longer, rinse kale and slice crosswise into ribbons. You can remove the stems if you like but I don’t usually bother. Cook over a medium heat with a little oil or butter in a large pan. Keep the pan covered so the kale can steam and stir every few minutes. Will take about 5 minutes. Keep refrigerated in a container for 3-4 weeks. One of my favourites, just finely slice and toss in your favourite salad dressing. I particularly like this green chickpea salad if you need a recipe. See below for my latest kale-centric obsession. Wilt kale into your favourite curry. Or use instead of the spinach leaves in this lamb saag. The Tuscans have a famous soup called ribolitta with is basically minestrone with some stale bread and kale wilted through it. I love how the kale adds its beautiful dark green colour. I also often use kale in my refrigerator soup. Perfect for when you feel like a healthier salty snack than potato chips. Toss kale leaves in a little oil and bake on a tray for 10 minutes or until crisp. Also good with parmesan grated over. A favourite in our house is this kale and onion pizza. Something I have at least once a week. Just serve the kale leaves whole if small or sliced. Fergal is a fan of ‘gumming’ raw kale with a little egg yolk smeared on one end. And here’s my poached egg recipe if you need some tips. Like this ground beef with kale. It’s also great with oyster sauce as a substitute for Chinese broccoli or bok choy. Another all time favourite dinner around here. A bonus section for garden lovers. I’ve had heaps of luck growing kale. Just plant the seeds directly in the ground in Autumn (Fall) and it will grow right through the Winter. It will withstand severe frosts and actually tastes sweeter after the first frost. Inspired by my latest favourite YouTube cooking show, Bondi Harvest. This is the type of thing I love to make when it’s just me for dinner. If I’m not super hungry I’ll just have a heaping bowl of the kale on it’s own because (IMHO) you can never have too much kale. But if I’m ravenous I’ll add some protein in the form of a poached egg or some cheese. 1. Heat butter on a medium heat in a largish saucepan. 2. Wash kale. Don’t dry as the water will help it steam. Cut into ribbons about 2cm (1in) or finer across the stem. 3. Add kale and garlic to the pot. Cover and cook stirring every few minutes until the kale has wilted down. Will take about 5 minutes. 4. Remove from the heat and stir in lemon juice. Season and serve with ricotta on top, if using. 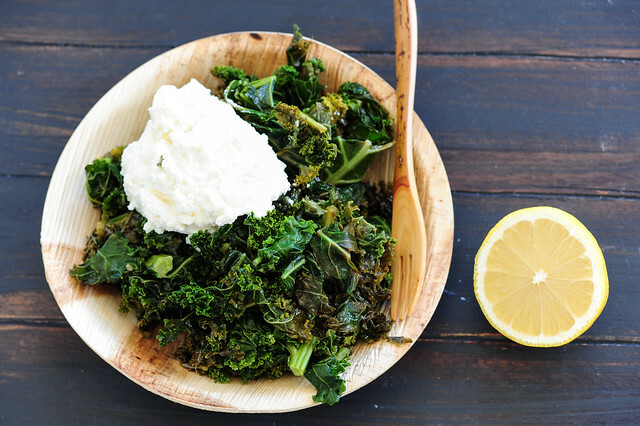 dairy-PALEO free – use olive or coconut oil instead of the butter and serve the kale on its own or replace the cheese with a poached egg or some cooked chicken breast or thigh. vegan – use olive or coconut oil instead of the butter and serve the kale on its own or replace the cheese with a huge handful of roasted nuts or chunks of avocado. no kale? – will work with pretty much any greens such as spinach, baby spinach, chard (silverbeet), collard greens, beet tops. different cheese – I’ve used ricotta here but most cheese will work well. Try goats cheese, parmesan, blue cheese, cottage cheese, cheddar, or some pan fried halloumi. In The Netherlands we eat kale all the time during wintertime. Mostly mixed with mashed potatoes (stamppot), with added bacon and smoked sausage. 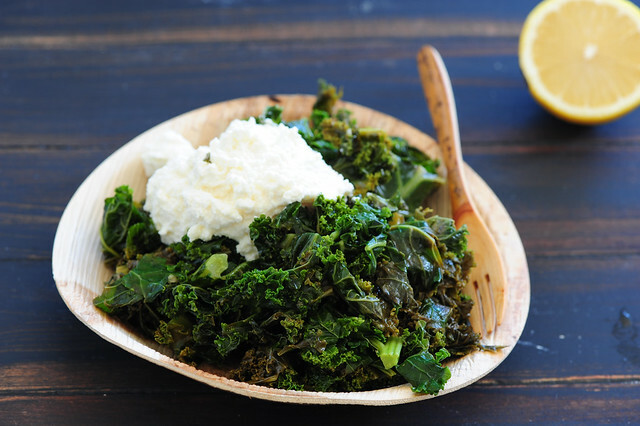 Love the sound of kale with mash! I’m having the same snail wars with my strawberries… Can’t wait to get some chickens to eat the excess snails! Beets – besides the obvious roasting or grated raw in a veggie bowl or salad what else can I do with them? Happy 2014 and 8th blogversary from Iran! This is a helpful idea to list multiple options to cook a vegetable, gives flexbility for weekday meal planning. Yum, kale. I could eat it all winter long! My favorite way to eat it is sauteed in olive oil with garlic, so simple and so delicious. I normally do olive oil too Catherine but butter really takes it to a new level! I’ve sort of forgotten about kale for a bit, but there are several plants in the garden. It’s one of the few things that I can grow right through winter in my climate. You’ve inspired me to get out there and harvest a little for tonight’s supper. Kale is not something I have eaten much of in the past but, I am looking forward to having a go now, thank you. Another vegetable I always have trouble with is eggplant/aubergine…I can not seem to cook it to draw the flavour out of it and for that reason, I generally won’t eat it. Some lovely recipe ideas will be much appreciated. I’d love some ideas for cabbage! We are growing our own kale and having it in juice each morning. Nom Nom. Yay for kale in the morning! oh and parmesan cheese melted on the kale instead of ricotta. Parmesan is a fav of mine too Jill! Made this today with a little bacon thrown in. Really delicious and kept me going all afternoon. Amazing! Nice idea with the bacon Jacqueline! This is a great idea. Broccoli is our favorite vegetable. I look forward to more in this series. What a great post about kale! We have some hidden under row cover in the garden this winter. We’ll have to try this. Glad you enjoyed it Jennifer! Mmm I LOVE kale and it’s so good for you! A winter favourite soup is Caldo Verdo – kale and potato soup. I’ll have to make a kale & potato soup this winter… My favourite veg and my Irishmans favourite together at last! Woot! Thrilled this idea made it into your blog and looking forward to any other veg you decide to give similar treatment. Of course, my favorite way to make kale is your salad from the No Worries Thanksgiving/Christmas book. We convinced our caterer to make it for our wedding reception and people are still asking for the recipe 2 years later… Thanks Jules! I’m so happy to see things going well for you and still inspired by your brilliant way around the kitchen. Do you have any idea what cancer risk can the chemicals in kale can help to reduce?